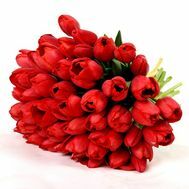 Traditionally, lovers are given roses (the color of the bud can be traced to the development of relations). 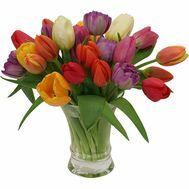 The most interesting is that the beauty of such a bouquet is estimated, for the most part not by the originality of the composition, but by the length of the legs (strange, is not it?). 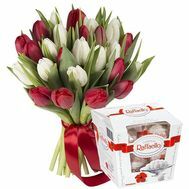 However, recently this "original" tradition began to die off gradually, and the girls finally found out that besides roses there are also orchids, gerberas, chrysanthemums, tulips, irises. 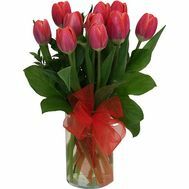 The latter, by the way, are not very popular so far, as they are considered more simply garden flowers than the subject of a present of a loved one. 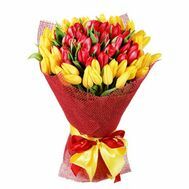 It's a pity, because it is the delicate coloring and the original shape of the flower that can emphasize the charm and charm of the girl. 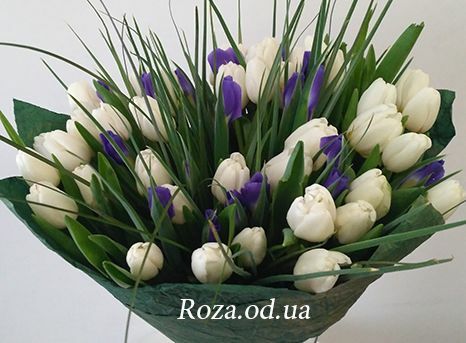 Florists of our flower shop in Odessa advise to pay attention to the composition of tulips and irises. The first emphasize that you value coziness and home environment, are not inclined to adventurism. The girl subconsciously will guess that for you it is not a passing fad. 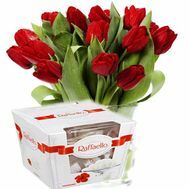 You are prone to serious relationships and appreciate it as a keeper of the hearth. 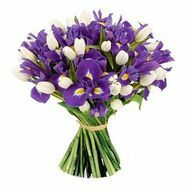 Irises, on the contrary will show the beloved, that you have long noticed her originality, originality, femininity, refinement, grace. 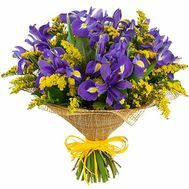 In addition, girls perceive iris as a sign of innocence, fidelity and strong conjugal love. 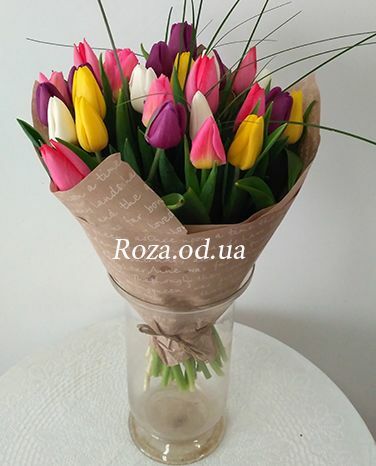 Our site provides an opportunity to choose any composition of tulips and irises for a lover, wife, mother with delivery of a bouquet in Odessa . 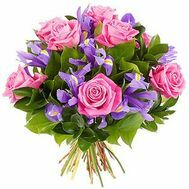 Qualified florists will tell you what color combination is most suitable for a particular event, the color of the eyes, hair, age of the woman. 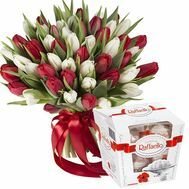 The indisputable advantage of irises and tulips is the presence of a huge variety of shapes and colors of buds. 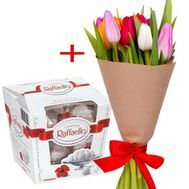 This allows you to compose even a bridal bouquet of them. It does not matter that she chose a traditional white dress. 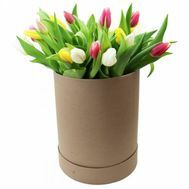 According to experts of our site, it will be suitable for light blue, beige, creamy irises and tender pink tulips. Also, a variety of shades will make an original gift also in case of joint rest. For example, by inviting a woman to a theater, you can carefully ask about the color and texture of the dress in which she appears on the show. 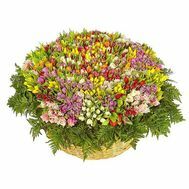 Depending on this professional florist will choose the colors and shapes of the buds, the composition of which will not only hit the beloved, but also all who will see how beautifully the bouquet of flowers is beautifully decorated by the evening toilet and the charm of the lady. 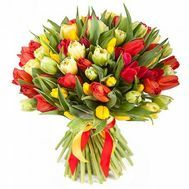 It is worth noting that the composition of tulips and irises will be very appropriate, since it symbolizes the awakening of nature from a long and cold winter. 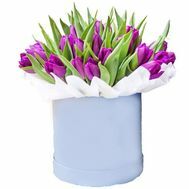 In the early spring months it is appropriate to give bouquets of saturated blue irises and bright tulips, which will underline the arrival of the long-awaited spring riot of colors and heat. 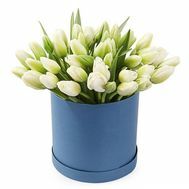 On the contrary, pale flowers presented to the girl will symbolize not only her innocence and faithfulness, but also emphasize the romantic mood of the giver, charmed by the awakening nature.